An amusing bit of social networking humor. Click on "related article" at bottom of this post. It isn't quite the classic that "if operating systems were airlines" (http://ipcarrier.blogspot.com/2007/12/if-operating-systems-were-airlines-part.html) is, but is chuckle-inducing, nevertheless. Shorter Sales Cycles for Communication Services? Life always is so much more interesting than one suspects. Consider the conventional wisdom that enterprise buyers are spending more time than they used to making communications decisions. Arunas Chesonis, PAETEC CEO, says sales cycles now are shorter than they were three to six months ago. "People are being forced to make decisions much faster," he says. A client was looking at buying an MPLS network. The chief information officer said he was going to make a decision in about 10 days. "Typically, you'd see something like that goes 60 days before they make a call," says Chesonis. "I can't quantify exactly for you how fast people are making decisions, but the economic pressures are absolutely affecting sales cycles on operating type services, something that would affect operating expense. "If you're talking CapEx, a lot of these people are just deferring the decision till later this year, early next year, they're trying to conserve cash just like a lot of folks that are out there," he adds. Lots of executives say sales cycles are stretching out. But Chesonis may be on to something. Nokia CEO Olli-Pekka Kallasvuo has hinted that the Finnish handset giant could soon enter the laptop market, reports Reuters. IKallasvuo says the firm is "looking very actively" at the opportunity. His comments appear to confirm long-running speculation that the world's largest handset vendor will diversify into laptops. "We don't have to look even for five years from now to see that what we know as a cellphone and what we know as a PC are in many ways converging," Kallasvuo said. The vendor is rumoured to be developing computers based on ARM's new 'Sparrow' processor for netbooks and Mobile Internet Devices (MIDs) and is reportedly looking at a 2011 launch. IU.S. 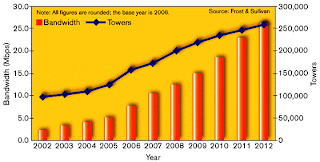 demand for business Ethernet service ports expanded at a rate of 43% during 2008, Vertical Systems says. Spurred by lower bandwidth costs and higher service availability, enterprises of all sizes purchased carrier-based Ethernet to support their business networking applications, according to Vertical Systems. "Despite a near paralysis of new telecom spending at the end of the year, there were tens of thousands of new Business Ethernet service installs during 2008," said Rick Malone, principal at Vertical Systems Group. "Deployments were most active in the third quarter before many enterprises implemented spending freezes or staff reductions. Customer installations in the fourth quarter consisted primarily of follow-through on in-process network conversions." Based on retail customer port installations, AT&T maintained its U.S. market leadership in 2008, although considerable momentum by Verizon narrowed the gap. Attaining a position on Vertical Systems Group's 2008 Business Ethernet Leaderboard with 5% or more of the market are eight service providers in the following order by share: AT&T, Verizon, tw Telecom, Cox, Qwest, Cogent, Time Warner Cable and Level 3. Will Rural Broadband Create Jobs? The general notion about broadband spending mandated as part of the national economic “stimulus” plan is that it will create jobs. To be sure, construction of the access networks will drive some direct employment. Some 128,000 jobs (or 32,000 jobs per year) could be generated from network construction over a four year period, and each job would cost $50,000, according to Dr. Raul Katz, adjunct professor at the Columbia Business School. Beyond that, such new broadband facilities are supposed to spur economic development as well. But will it? Unfortunately, says Katz, research on the productivity impact of broadband indicates the potential for capital-labor substitution and consequently, the likelihood of job destruction resulting from broadband deployment, as well as some incremental job creation. So the issue is whether net job creation exceeds net job destruction, and by how much. You might think bringing broadband access to any community can only be a plus. As it turns, out broadband creates jobs and destroys them as well. Since broadband tends to enable the outsourcing of jobs, a potential displacement of employment in the service sector from the area targeted for deployment might also occur, says Katz. Also, some job creation in the targeted areas could be the result of relocation of functions from other areas of the country, and therefore, should not be considered as creating incremental employment, he adds. Still, Katz says, the study results indicate that some job creation aside from the actual construction jobs is feasible. “Our estimates indicate that over four years the network effects could range from zero to 270,000 jobs over four years (approximately 67,500 jobs per year), although anecdotal evidence would point to the lower end of this range,” says Katz. Firms Losing 40% of Time Because of Communications Inefficiency? On average, 70 percent of of small and medium business execitives recently surveyed say they spend 17.5 hours each week addressing the pain points caused by communications barriers and latencies, according to a global study sponsored by Siemens Enterprise Communications and conducted by SIS International Research. 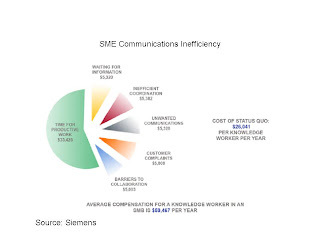 If Siemens results are typical, mid-sized organization personnel might be wasting as much as 40 percent of their available time dealing with communication latencies of one sort or another. Most small businesses probably will not agree, but communications inefficiency obviously scales with organization size. People who track telecom service provider capex are going to have to account for some likely shifts in the composition of that capital investment. For telcos providing IPTV, a significant percentage of ongoing capex is related to providing customers with relatively-costly in-home decoders. Comcast, which has built its business on the use of such terminals, is about as efficient as any provider can be, and gets the absolute best volume pricing on its gear. Yet it still devotes at least 18 percent of overall capex to the purchase of such boxes. Telcos, who likely are not yet getting volume discounts as large as Comcast's may find as much as a fifth of their overall capex now devoted to customer premises equipment. That is going to shift thinking in the direction of variable CPE investment rather than the network transmission categories that traditionally have dominated spending. The other change is that IP-based gear in most cases costs less than legacy equivalents, so any given dollar of capex spending buys more capabilities than used to be the case. The clear implication is that less gross capex might be needed for any given unit of derived revenue. The other long-term change is that more of the value of capital comes from software investments rather than hardware. So telcos will be spending more capex on software, and less, proportionally, on hardware, or transmission hardware. More of the hardware spend is going to be premises based. One probably can see that in the case of Ethernet, DSL, video, telepresence or virtual private network services, for example. Financial markets hate uncertainty. Right now, all we've got is massive uncertainty. Where's the governmental competence? If one measures the value of broadband not by simply "organizations that can buy broadband" (availability) or "homes buying broadband," (demand), but rather as a the ability a nation has to harness broadband to drive economic growth, the United States ranks first in the world, says Leonard Waverman, Fellow of the London Business School and Dean and Professor at the Haskayne School of Business at the University of Calgary. The United States has seen more clear-cut productivity gains than has Europe, and a major source of this U.S. productivity advantage is broadband usage by businesses that are not themselves producers and providers of broadband services, Waverman says. well they are able to use the lines, says Waverman. "The notion of connectivity should be expanded to include also the complementary assets (software) and skills — embodied in people, governments and businesses — that determine just how productively the hardware and infrastructure are used. of these networks, hardware and software," he notes. Consider the case of Korea, which has a very advanced fiber to the home capability. However, Korea is also a very heavily business-driven economy in that the levels of business investment and intermediate consumption are very high compared to the level of consumption by the consumer sector. On measures such as business spending on enterprise telephony and data services, Korea’s performance might be termed “lackluster,” Waverman says. By way of contrast, U.S. businesses are leaders in use of IP telephony and other broadband-based technologies, as well as the more subjective ability to use technologies as sources of business advantage, and drive innovation. As with all such cross-nation "rankings," there is some element of subjectivity. Still, the point is well taken: broadband economic benefits cannot be measured by simple reliance on penetration or availability data. Human, cultural and institutional capital play a big role. "Schumpeterian" times of "creative destruction" seem to be upon us. Note a recent ChangeWave poll on PC purchasing. 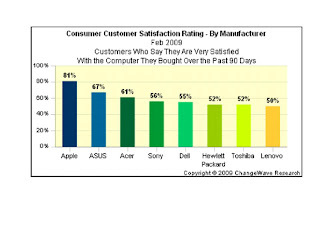 You wouldn't be surprised to learn that Apple ranks number one in customer satisfaction. You might be shocked to learn that Asus and Acer rank second and third, above Sony. As satisfaction rankings are about value and price, something is going on here. Apple doesn't win because of its price. Asus and Acer play there, but I think something more profound is going on. Both firms have created a new value position in the market with their hot-selling netbooks. Prior to that, both firms had staked out positions in the value-priced notebook segment as well. But it is probably the netbook that will have the greatest implications for Asus and Acer over the next couple of years as each attempts to establish a retail brand. It isn't simply that their netbooks sell at retail for a bit less than $300. It also is that the value of a netbook might be higher than the notebooks it is intended to "complement or replace." That's disruptive, at least for PC retailers. What isn't clear yet is whether netbooks will be disruptive in other ways. It is clear that lower-end PCs and higher-end mobile phones are heading for each other. In fact, Acer already has unveiled a line of smart phones. Content, Distribution, Attention: What is King? Many years ago, as a graduate student in managment, Herbert Simon was taught to us as a theorist with a lot to say about the way human beings in organizations behave. These days, he returns anew as a theorist whose work informs us about the logic of digital media. "What information consumes is rather obvious: it consumes the attention of its recipients," Simon once said. "Hence a wealth of information creates a poverty of attention, and a need to allocate that attention efficiently among the overabundance of information sources that might consume it." In a world where so much content exists, the key problem now is "getting noticed." That tends to mean "distribution" is less important than in the past. Think of a past world with limited outlets for radio, TV or print content, so unlike our present world where there is almost no physical distribution barrier, while the true barriers essentially amount to affirmation by audiences. To use the overworked phrase, "users rule." One doesn't sell, one invites. One doesn't push, one pulls. "Attention" scarcity also puts a new perspective on the old debate about whether "content" or "distribution" is king of the value chain. "Both" or "neither" are equally good answers in a world of content abundance where the objective simply is "attention." Across consumer markets, attention is becoming the scarcest, and so most strategically vital, resource in the value chain. Hence marketing now becomes both tougher, and more necessary, and more attention now is shifting to "inbound" rather than "outbound" marketing, pull rather than push. Since the business foundation for much of media is marketing, media are bound to change. So are lots of other things. If you think about it, Google's page ranking mechanisms continue to emphasize "linking," which is seen as a proxy for "attention." It's interesting how a theorist you once "met" in one context now seems so relevant in an entirely-different context. Use Enterprise Sales to Drive Consumer Web Apps? It might sound counter-intuitive, but at some observers think Web-based software products not only can span enterprise and consumer user segments, but can leverage enterprise deployments to spur consumer penetration. Some even think Web apps specifically seen as consumer tools can be sold directly to enterprises with little or no modification. That is roughly the reverse of what has tended to happen in recent years as the normal technology transmission belt has been inverted. But the process would be something of a return to past adoption patterns, in roughly the same way that "software as a service" and cloud computing now "returns" us to an earlier era with some resemblance to a mainframe or centralized model of computing. In the past, software and hardware innovations tended to be "discovered" in the universities then commercialized first in the enterprise buyer segment. Over time the price and feature set would be "de-tuned" for the mid-market, with adoption then spilling over into the small business market and then sometimes even in the consumer market. Now some observers say targeting the enterprise "edge" can stimulate buying in the broader consumer market. What is different, and might enable this to work, is that Web apps are much easier to adopt in an enterprise environment. Less customization is needed. Also, the user interface, designed for consumer use, tends to require less training, again reducing the hassle factor for adopting in an enterprise environment. Volume Discounts Wrong for Social Software? 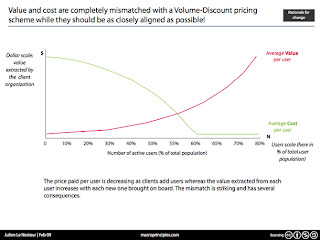 Volume-discount pricing structures are the norm in the computer and most other businesses. But Julien le Nestour, an adviser, investor, and manager at Schlumberger, argues that for some "products" such as social networking, value grows as users grow ("network effects"), making the value of an application with 70-percent use much more valuable than an application with 10-percent usage. But under typical volume-pricing practices, buyers pay more for the less-efficient than for the highly-efficient "product." So pricing should invert. Discounts should be offered for low-penetration use, and rising prices for high-penetration use. If customers extract more value (higher returns) per user as the number of users increases, yet pay an ever-decreasing price per user (which is VD pricing), value and price have diverged. 41% of U.S. Internet Users are "Social"
Researchers at eMarketer estimate that in 2008 nearly 80 million people, 41 percent of the U.S. Internet user population, visited social network sites at least once a month, an 11 percent increase from 2007. 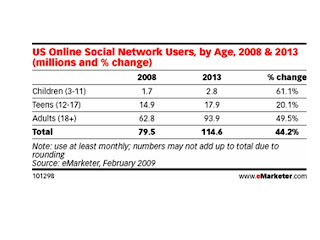 By 2013, an estimated 52 percent of Internet users will be regular social network visitors, according to eMarketer. Parks Associates research finds 80 percent of broadband users in key European markets prefer traditional video viewing to online viewing. Depending on how you want to spin it, that is a glass half empty or half full. “Broadband has transformed video viewing habits in Western Europe, where over 20 percent of broadband households have watched a film or TV program online in the past six months,” say researchers at Parks Associates. European consumers are adopting online viewing habits with some reluctance, however, Parks Associates says. For all the countries surveyed, the U.K., Germany, Spain, Italy, and France, over 80 percent of broadband households prefer a more traditional option for viewing video, including going to the cinema or watching a DVD. Many consumers are watching video online only because of the availability of free content, both legitimate and illegitimate, the researchers note. About 57 percent of U.S. farms had Internet access in 2007, up about seven percentage points since 2002, and 58 percent of U.S. farms using the Internet in 2007 bought high-speed Internet access, according to the U.S. Department of Agriculture. In 2002, the Census found that half the farms in the country were connected to the Internet in some way, using either broadband or dial-up services. So 33 percent of farms in 2007 purchased broadband connections. Penetration likely is higher now, though most observers think rural broadband, to say nothing of use by rural farmers, remains lower than usage by urban or suburban customers. Researchers at the Pew Internet & American Life Project say 55 percent of homes now buy broadband access, up eight percentage points since 2007. If rural use grew at a comparable pace, farm use of broadband could now stand at 41 percent. The other angle is that farmers in the West have the better access than the rest of the nation to high-speed Internet, the Department of Agriculture indicates. Nationally, 31.3 percent of farms in rural counties had broadband connections. In urban counties, by way of contrast, the survey showed almost 40 percent of farm operators had high speed Internet connections. The rural West led the nation with 38 percent of farms reporting access to high-speed Internet. Of the states in the Rockies, Colorado had the highest percentage of farms with broadband access with 47.9 percent, about 45.4 percent higher than the national average. New Mexico was the only state in the West (including Hawaii, California and Alaska) that had rural farm broadband penetrationlower than the national average. Statewide, 43.2 percent of farmers had access to broadband, 10.4 percent below the national average. Nationally, 31.3 percent of farms in rural counties purchased broadband connections. In urban counties, nearly 40 percent of farm operators had high speed Internet connections. BBC, mBlox and Vodafone Group, working with the Mobile Entertainment Forum, have launched "Smart Pipe Enabler Services," a way mobile operators can offer third-party content and app providers a variety of services including age verification, location, identity authentication, reliable phone applications, specific tariffs to consumers and delivery with specific quality of service. Enabled by these services, content providers can offer the consumer a better user experience, a key objective for much of MEF’s work. The move is a major step towards creating an entirely new revenue source: business partner revenue streams, while improving end user experience and moving beyond any notion of access networks as "dumb pipe." At the moment, of the $32 billion worth of revenues in the mobile entertainment industry, about half is based off-portal. The new "smart pipe" approach is aimed at offering those providers the option of features now available primarily to operator-provided services. Among those features are bulk SMS capabilities, premium billing, short code rental and location look-ups. Enabling services operators can offer include handset features, user presence information, age verification, "sender-pays" data, user demographic profile, handset application control, electronic wallet, credit status and location. At a high level, nobody is completely sure consumer behavior in this recession will match behavior in past recessions, for any number of painfully obvious reasons. There also is some thinking that as broadband had not attained mass adoption status during the last recession, this will be the first test of demand elasticity for fixed broadband. And nobody seems to believe that wireline voice will in any way be helped. There is probably less consensus on what will happen in the wireless business, but wireless service providers likely are among the best-placed industry segments during the recession, in part because of greater "flexibility in their cost structure and capex and fixed-mobile substitution," a new report by the International Telecommunications Union says. And though broadband access demand is believed to be relatively inelastic, that almost certainly will not be the case for fixed voice. "Telecom services are likely to come under further price pressure, as operators will fight for a more cost-focused customer, resulting in further erosion of margins," the ITU suggests. And that is going to favor mobile operators as well. "The more flexible cost structure of mobile networks means that mobile operators are winning more of the lower usage end of the fixed services customer base," the ITU says. "This has happened in voice, and 2008 has demonstrated that mobile broadband can substitute for light-usage DSL." For countries where data services are popular, data revenues could be adversely impacted by a reduction in consumers’ real incomes, ITU says. Also, more consumers are likely to opt for prepaid and flat-rate packages for telecom services to try and control their expenditure. fully to mobile services. Young people may delay decisions to adopt a fixed broadband or voice line in addition to mobile service. Unemployment will accelerate households’ decisions to give up fixed services, either because they are unaffordable, or because a mobile alternative is cheaper. "In terms of practical pricing strategy, the economic slowdown will increase pressure on operators to reduce prices," the ITU says. Operators will find it harder to promote value-added services and the adoption of new services such as mobile TV will be affected, ITU believes. $200 Million More in Videoconferencing Service Revenue This Year? An Association of Corporate Travel Executives survey shows that 71 percent of its member companies plan to spend less on travel this year than in 2008. According to the trade group, that’s a huge and unprecedented shift in corporate travel mangers’ plans from just five months ago. ACTE’s new survey shows most companies are seeking to spend 10 percent to 20 percent less on travel than they reported in September of 2008. Using the most conservative figures for estimating the dollar impact of such cuts, ACTE suggests that the 176 member companies responding to the survey will spend about $880 million less on travel this year than they had planned. If the same estimate is applied to the ACTE’s full membership of 2,400 companies, the impact would be more than $2 billion. That should lead to opportunities for Web and other conferencing services and applications to get more traction, undoubtedly including many users and companies that have not historically relied on conferencing services, especially those with a video component. Assume just 10 percent of the avoided $2 billion is spent on video-enabled conferencing services. That's a gain of $200 million in service provider revenues. The struggling economy will slow the growth of enterprise IP telephony adoption, In-Stat researchers suggest. Some 32 percent of enterprise-size businesses say the economic situation has slowed their VoIP deployment plans. Broadband IP telephony remains the most common carrier-based business VoIP solution with revenues exceeding $1.1 billion in 2008, compared to $857 million for hosted IP Centrex service within the United States, In-Stat says. Adoption varies significantly by size of business, with enterprise-sized businesses preferring a partial deployment, while small office and home office users are more likely to go IP-only. About 13 percent of U.S. businesses use both carrier-based and premises-based IP solutions. Slightly more than one in three US businesses that have deployed VoIP use it exclusively, In-Stat says. Many more businesses use VoIP as a partial voice solution. U.S. businesses are also beginning to embrace voice-enabled IM capabilities, particularly among younger workers. Mobile backhaul now represents more than 30 percent of mobile service provider operating costs, says Juniper Networks. 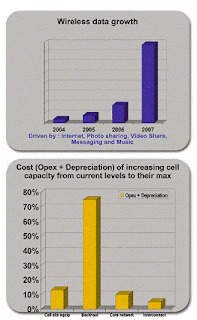 If one looks at opex and adds depreciation, backhaul can represent 70 percent of on-going costs. Up to this point, most of the mobile backhaul has been provided by T-1 lines or DS-3 connections, in some cases. But deployment of 2.5G and 3G technology has lead to an increased backhaul requirement, to say nothing of coming 4G requirements. So where base stations that previously required one or two T1/E1’s for backhaul now need four to six T1/E1’s. The result has been a 200 percent to 400 percent increase in required backhaul capacity and its associated increase in operating expense costs. Telcordia analysts predict there will be a $15 billion wholesale transport revenue opportunity in the mobile tower backhaul market by 2011, based on new needs to get broadband backhaul to more than 200,000 wireless network cell sites in the United States. Andrew (Andy) Werth, a satellite industry pioneer, died January 28. He was 74 and lived in Washington, D.C. He co-founded a digital satellite communications company that eventually became Hughes Network Systems. Mr. Werth later became president of the company’s international division. Andy was an avid cyclist, finishing one place short of qualifying for the U.S. cycling team in the 1952 Olympics, though he won numerous other events in his youth, including the New York State Junior Championship and the Tour of Somerville. A victory in a nine-day cycling event in Canada earned him enough prize money to pay for his first semester of college. He resumed cycling later in life, and won the Masters National Track Championship in 2000, 2003 and 2004. Until slowed by illness, he was an active member of DC Velo, a Washington-based cycling club. Beyond that, what many of us always will remember is his mentoring and teaching, born, no doubt, of his genial and caring nature. Thanks, Andy. Mr. Werth was born in Saarbrucken, Germany on March 2, 1934, to a German father and a French mother. His family fled the Nazis, and by the time he was 10 years old, young Andrew had lived in four countries, learning a new language with each move. 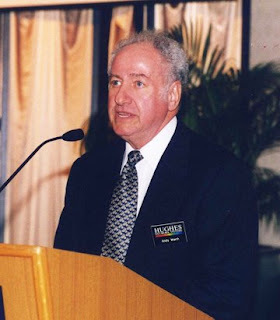 His fluency in many languages and ease with international clients helped him establish Hughes’ presence in 17 countries and build international sales to $1.4 billion by the time he retired in 2000. Mr. Werth, a graduate of Columbia University and an Air Force veteran, began his career at ITT Laboratories in New Jersey. Following the launch of Sputnik, he was assigned to do research in digital satellite communications in the late 1950s. He left ITT for satellite operator COMSAT Corp. in 1964, and his first job was working on the Early Bird project team with the manufacturer, Hughes Aircraft Company. He soon transferred to COMSAT Laboratories, where he developed a series of high performance satellite modems and was awarded a number of patents in satellite communications applications. His work in the digital satellite communications was cited in 1982 when he was named a Fellow of the Institute of Electrical and Electronics Engineers, the profession’s highest award. In 1972, Mr. Werth and a group of colleagues left COMSAT to form Digital Communications Corp. (DCC), a company that specialized in building sophisticated digital communications systems utilizing both terrestrial and satellite technology. The company prospered and was acquired in 1978 by Microwave Associates and became MA/COM Telecommunications, which was acquired by Hughes Electronics in October 1987, becoming Hughes Network Systems (HNS). Mr. Werth was initially general manager of the satellite communications division. He later led international marketing and sales for a new satellite technology, very small aperture terminals (VSAT), that eventually became the backbone of the private satellite network industry, connecting millions of retail establishments, hotels, gas stations, and other users. 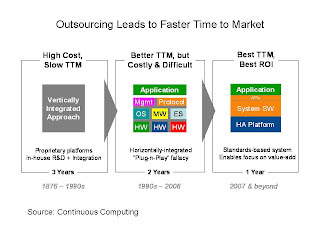 Voice has for decades been a "service" sold by the "the line" or as an "application" created by a premises switch. Now voice also is a feature of instant messaging, Web sites, enterprise applications and email. As a result, there now are multiple business models, revenue streams and applications that use the "voice" feature. This panel will examine some of the ways this is happening, and what it means for traditional providers of voice services. Click on "Related Article" at the bottom of this post for the first of five parts. Click "Watch in HD" if you have the bandwidth. click "Related Article" at the bottom of this post to launch the first video segment. Also, if you have the bandwidth, select "Watch in HD." It's better. A huge explosion in mobile broadband use in Europe over the next five years largely will be driven by consumers, and largely will complement, not supplant, wired broadband connections, predict researchers at Analysys Mason. That said, a separate forecast by Informa Telecoms & Media suggests the potential for broadband substitution will remain high. Analysys Mason projects148 million mobile broadband connections in Europe by 2014, when they will account for almost half of all broadband connections in the region. The potential for fixed-line voice substitution also will remain high. About 40 percent of total mobile traffic was generated in the home environment in 2007, says Informa Telecoms & Media. By 2013 it is expected to reach 58 percent, with about eight percent of total mobile traffic offloaded to fixed broadband. In 2008, the home environment likewise represented more than 43 percent of total mobile data traffic and will climb to 60 percent by 2013. That's the danger for fixed services providers, particularly in single-person households, households of non-related persons and households where every person in the household above a certain age has a mobile. Mobile use at home will represent about 40 percent of total mobile usage, while use at work will represent 30 percent of usage, with nine percent of calls initiated while users are moving. About 21 percent of calls will be generated from other public environments. "In the same way that voice traffic has moved from old fixed line telephony service PSTN to mobile, there is reason to believe that a significant percentage of Internet traffic generation will move away from fixed personal computers to mobile devices including mobile handsets, mobile Internet devices (MIDs) and connected notebooks," says Malik Saadi, Informa principal analyst. As more casual users adopt mobile broadband, they typically will do so as a complement to tethered broadband, usually opting for prepaid subscriptions rather than monthly contracts, Analysys Mason forecasts. Prepaid subscriptions will account for 59 percent of mobile broadband connections in 2014, up from eight percent in 2008. New customers will tend to behave differently from early adopters and users who have substituted wireless for wired connections, many observers believe. Most significantly, use will be casual. So, at some point, continued growth of mobile broadband in the U.S. market likewise will require charging mechanisms better suited to casual users, who will not be inclined to add substantial fixed-fee subscriptions when their anticipated usage is relatively light. T-Mobile Outage: "All Markets West of Mississippi River"
Apparently there also was a Feb. 3, 2009 outage on a more-localized basis on the AT&T network in Houston, New York, New Jersey and Baltimore/Washington D.C. areas. There are some reports T-Mobile and possibly some Sprint BlackBerry users had the same issue on Feb. 3, 2009 as well. Undoubtedly there will be finger-pointing, but it would seem to be a RIM issue if multiple networks had outages at the same time. About 40 percent of total mobile traffic generated in the home environment in 2007, says Informa Telecoms & Media. By 2013 it is expected to reach 58 percent, with about eight percent of total mobile traffic offloaded to fixed broadband. In 2008, the home environment likewise represented more than 43 percent of total mobile data traffic and will climb to 60 percent by 2013. Mobile voice minutes of use in the home environment represented about 42 percent of total mobile voice traffic by the end of 2008. Mobile voice usage at home will gradually increase to reach 49 percent by 2013. Mobile use at work will represent 30 percent of usage, with nine percent of calls initiated while users are moving. About 21 percent of calls will be generated from other public environments. Fixed-line call volume and access revenues fell by two percent during the third quarter, the U.K. Office of Communications now reports. Total residential call volumes in the third quarter of 2008 were nine percent lower than in the third quarter 2007, while total business call volumes fell by five percent over the same period. The total number of fixed lines fell by 36,000 to 33.5 million during the quarter as well. The number of residential and small or medium business broadband connections increased by 322,000 during the quarter to 16.9 million. Total mobile revenue for the four largest mobile operators increased by 1.5 percent, quarter over quarter, Ofcom reports. Revenue from calls and other charges grew by 2.3 percent, though call volume declined by 0.05 percent, quarter over quarter. Roaming call volumes increased by 11 percent year over year. The number of outgoing international minutes grew by 14 percent over the same period. Core network infrastructure is moving along a path that will have software functions running on standardized hardware, such as blade servers. That's quite a change from a world where you could tell the difference between major brands of Class 5 switches just by looking at them. So note that Nokia Siemens Networks now has a new strategy focusing on hardware-independent solutions for core networks. Nokia Siemens Networks has introduced a new, open hardware architecture, where Nokia Siemens software runs on off-the-shelf hardware blades. The long-term goal for the strategy is to provide an open, multi-application, hardware-independent platform, where the same open hardware platform can be used for a variety of different network elements. The switch means the MSC Server mobile softswitch, which is currently implemented on the Nokia Siemens Networks DX 200 hardware platform, will run on open and standard blade servers. “This is the beginning of a major shift in the way we design our core network products,” says Michael Clever, Head of Next Generation Voice and Multimedia, Nokia Siemens Networks. “The future of control servers clearly belongs to pure software solutions that give network operators more choices to meet their hardware requirements. Operating on blade servers should allow for smaller equipment footprint and smaller power draw than the proprietary approach. The open hardware approach is already being applied to other Nokia Siemens Networks core network “control plane” applications, such as IP Multimedia Subsystem and the hiQ VoIP application server, which then can be combined with the MSS application. As of December 2008, 11 percent of online American adults said they used a service like Twitter or another service that allowed them to share updates about themselves or to see the updates of others, say researchers at the Pew Internet & American Life Project. Good thing the company just raised $35 million more in investment capital. It still is growing really fast. Small businesses (zero to 500 employees) represent 99.7 percent of all firms, employ about half of all private sector employees, pay nearly 45 percent of total U.S. private payrolls and have generated 60 to 80 percent of net new jobs annually over the last decade, according to the U.S. Department of Commerce. It's no surprise that smaller businesses therefore represent much of the underlying demand for communications and information technology purchases as well. It's a darn-near sure thing that such businesses will represent the only new net private sector jobs for the balance of the year. So it is noteworthy that small businesses were able to add new employees in January 2009, according to actual payroll processed by Surepayroll, which handles payroll data for more than 20,000 small businesses. There was a 0.3 percent increase in the average small business size between the December 2008 and January 2009 periods, meaning that the average small business grew in size in January. Hiring growth has been relatively flat of late, with the last five months all being in the 0.2% to 0.3% range. But small businesses added employees every month of 2008, the SurePayroll data shows. Of course, other data is not so comforting, if lethargic job growth can be called "comforting." A Gallup Poll survey suggests that small-business owners are cutting jobs. About 11 percent of respondents say they have increased the number of jobs at their companies over the past 12 months while 27 percent say they have decreased them. On average small businesses are still creating more jobs than they are destroying, SurePayroll says. And some of the resilence can be explained by greater reliance on outsourced contractors. In fact, January saw contractors representing 3.78 percent of total payrolls, the highest level SurePayroll ever has seen. But there are warning signs on the small company start-up front, however, which logically is a result of tight credit conditions. "In prior recessions, small businesses have ended up being net job creators," SurePayroll says. "This is not likely to happen in this recession because fewer companies are being formed." Perhaps the only good news here for providers of communication services is that potential small business demand remains a bit of a bright spot. Charter Communications will file for Chapter 11 bankruptcy as part of a financial restructuring on or before April 1. Charter says it has reached an agreement with a committee of some debt holders to reduce its obligations by about $8 billion. The company had net debt of slightly more than $21 billion as of Sept. 30, 2008, so despite wiping out what remains of the equity value, and paring debt by $8 billion, Charter will still have to contend with as much as $13 billion of remaining debt. Controlled by Microsoft Corp. co-founder Paul Allen and based in St. Louis, Charter has about 5.6 million customers in 28 states. The cable company has sold the most U.S. high-yield bonds of any company in the past decade, according to data compiled by Bloomberg. Allen bought Charter in 1998, amassed the company’s debt burden while building it into the fourth-largest U.S. cable provider. Charter has reported losses every year since going public in 1999. In some ways, Charter is less a victim of the current credit tightness and more a victim of the 2001 Internet and telecom crash, though, as the company has been struggling with high debt loads since that time. The parlay initiative (www.parlay.org), which aims to create APIs enabling telecom service providers to work with developers and industry technology suppliers, seems to be bearing fruit. TDC A/S, the Danish service provider, is using open application programming interfaces and making those APIs available to third-party application developers. TDC is using the service delivery platform marketed by Aepona Ltd., which has experience with this sort with Canadian carrier Telus Corp. TDC expects to be up and running by late summer of 2009. Aepona also provides similar capabilities for France Telecom, KPN Telecom, Sprint Nextel Corp. and TeliaSonera. The GSM Association is working with Aepona on a new initiative called Open Network Enablers API (OneAPI), as well. Vodafone Group, Telenor, Telecom Italia and France Telecom's Orange France are part of the OneAPI initiative. It had to happen some time, and now it has. 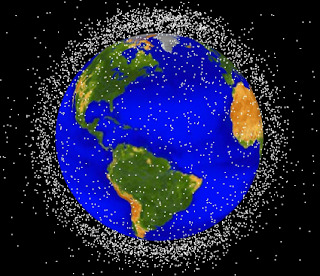 Two satellites, an operating Iridium communications satellite, and a defunct Russian satellite, collided in orbit on Feb. 10, 2009, destroying both objects and creating 500 to 600 new pieces of orbital debris, adding to about 18,000 other orbiting pieces of "space junk" softball-sized or larger that routinely are tracked. Iridium, which owns a fleet of 66 low-earth orbit satellites, expects minor outages, and will move an in-orbit spare into position within 30 days. Iridium isn't the only satellite communications provider facing at least some issues. Frost & Sullivan compared performance of more than 1,000 calls on Iridium and Globalstar networks, from Northern California and Central Texas. Tests also indicate that 98.1 percent of calls on the Iridium handset and 36.2 percent of calls on the Globalstar handset were successfully connected and completed without being dropped during a three-minute period. Globalstar admits it has a problem with duplex communications (not simplex). "As previously announced, many Globalstar satellites are experiencing an anomaly resulting in degraded performance of the amplifiers for the S-band satellite communications antenna," Globalstar says. "The anomaly is adversely affecting two-way voice and data services," the company says. "Customer service continues to be available, but at certain times at any given location it may take substantially longer to establish calls and the duration of calls may be limited." Until the new second-generation Globalstar satellite constellation is operational, Globalstar is offering its Optimum Satellite Availability T-tool (OSAT) on its Internet site, which subscribers may use to predict when one or more unaffected satellites will be overhead at any specific geographic location. Globalstar has launched eight spare satellites for its existing constellation with a view to reducing the gaps in its two-way voice and data services pending commercial availability of its second-generation satellite constellation, scheduled for initial launch in the second half of 2009. Click the "related article " link below to get the video, in 7 parts on YouTube. Today's telecom and cable companies face an increasingly complex and uncertain world in which continual and rapid change is the norm. But different providers face distinctly unique challenges. This panel will evaluate the ways contestants operating in different geographies and customer segments; with distinct business models and products; diverse regulatory and technology environments, evaluate where they are, and where they want to go. Continuous Computing, a suppler of protocol-centric hardware, software and systems to telecom industry original equipment manufacturers, is introducing a solutions and services practice in response to demand for more prepackaged platforms from global customers. The new practice will deliver customized, fully-integrated, application-level solutions to network equipment providers, especially in the wireless space, and including deep packet inspection capabilities. The move reflects a change in global telecom operations and technology development, which require faster development at lower cost, at a time when virtually all service providers and equipment suppliers have fewer in-house resources to do so, says Brian Wood, Continuous Computing VP. The new capabilities will accelerate the creation and delivery of carrier-class systems to service providers much faster, in many cases as much as 12 to 24 months faster, says Wood. The demand for more prepackaged platforms also is part of a broader industry trend to focus on core competencies, while outsourcing lower-level or less-essential functions to business partners. In part, that is a simple response to the fact that virtually all communications entities now operate with fewer in-house resources. But it also reflects a drive, across the ecosystem to add more value and differentiation. “OEMs are moving to software features while operators are moving to the marketing level,” he says. “Everyone is moving,” Wood says, and the transformational change arguably is greatest for the equipment providers, who have to change the most as headcounts are orders of magnitude lower than in decades past. There also is an industry-wide narrowing of the gap between enterprise solutions and carrier-grade solutions. Traditionally, enterprise products had a lifespan of two to three years, so costs had to be lower. Telecom products had lifecycles more in the seven to 10 year range, and were hardened. So development cycles were longer and cost was higher. These days, the gap is narrowing. Telecom equipment cycles are moving closer to the enterprise lifecycle as everything becomes IP based. So there is less distinction between enterprise class and carrier class products. Obviously carrier class products require more redundancy, more cooling and other modifications of basic platforms to harden them. But that is a truly big shift. Differentiation now occurs at the level of software, not hardware or protocols. And enterprise and carrier systems increasingly are produced on a common foundation. About $350 million of the version of the broadband stimulus package passed by the Senate will go toward mapping broadband coverage. Some will argue that it doesn't matter what "stimulus" spending goes toward, as long as the money goes to work immediately, is targeted and terminates once the recession is over, and there is sound logic there. The issue, though, is whether there is a terrible problem requiring that we "study" this matter some more. If one looks at where the United States ranks in telephone penetration, for example, the United States ranks about 16th, as measured by the Organization for Economic Development and Cooperation. One can quarrel with the methodology OCED uses, but for the moment consider simply the well-developed state of landline voice service. Does anybody really think the United States has a problem with wired voice penetration? And if not, why is a "15th in the world" ranking for broadband access a problem? A "back-of-the-envelope" forecast by economists at the Phoenix Center suggests that U.S. broadband subscription rates (keep in mind that we are talking about demand for the service, not its availability) will be about 75 percent of the telephone rate in 4.4 years, and broadband will equal the telephone subscription rate in 9.6 years. There is a difference between "lack of supply" and "lack of demand." The OECD statistics for broadband penetration are a "demand" metric, not a "supply" metric. And yet even on that score the United States demand for broadband already is equivalent to wired voice. Some things do need to be studied because there are problems of supply. But supply isn't really the issue for broadband. The problem is demand. In fact, as wired voice demand continues to decline, at least in the consumer market, why would we not see calls for studies of why wired voice penetration is so "low"? The reason we don't hear such calls is because demand is shifting. There is no problem with "supply." Mapping broadband might be a useful exercise for some. But mapping doesn't change the demand equation, which is the only problem broadband currently faces. One might argue that prices are too high, or speeds too low. But that is a problem only if supply is not being upgraded. And it is hard to argue that is not occurring at a rapid pace. In fact, broadband already has been adopted at rates that surpass nearly all key consumer products of the last 100 years. Only use of the Internet itself is a reasonable candidate for "fastest-adopted" innovation. There are lots of problems to be solved. Mapping broadband, to pinpoint supply constraints, doesn't strike me as being one of them. The telco broadband market experienced a significant downturn in new subscriber additions during 2008, according to iSuppli Corp. Of course, the reason is that the market is mature: most users who want broadband already buy it. As a result, the next several years will be about enticing customers to migrate to higher-speed tiers and enhanced services, principally IPTV. In part, this will lead to a shift in lead product offering and a slower growth rate than broadband access had achieved. Some major telcos are pushing IPTV services more than Internet access, a product category in which there are entrenched incumbents. In the broadband access market, there were no incumbents to dislodge, so growth was not a zero-sum game. In the IPTV market, growth will come in the form of market share shifts, a tougher proposition. “New telco broadband subscriber growth saw a 9.1 percent decline in 2008 following double-digit gains during the prior five years,” says Steve Rago, iSuppli principal analyst. “Hardest hit was North America, with new subscriber additions in 2008 amounting to 3.1 million, down 56.1 percent from 6.5 million in 2007. "The world’s developed regions reached broadband saturation during 2008, while developing regions continued to grow," he says. "Of these regions, Latin America experienced the strongest growth." New Fiber-To-The-Home connections grew by 90 percent and new high-speed VDSL connections grew by 54 percent compared to 2007, iSuppli says. In the cable world, many European and American operators introduced DOCSIS 3.0, significantly increasing broadband access data rates. The next round of growth therefore will not come in adding new broadband subscribers but getting them to upgrade to higher-speed and enhanced services. Analysts at iSuppli believe 2008 was a milestone in the growth of very-high-speed access networks, and expect accelerating growth in the category over the next several years. Telco TV was a major driver of high-speed access upgrades during 2008, iSuppli says. Virtually every telephone company and competitive access supplier deployed or made plans to deploy television services during 2008, the firm says. Overall telco TV subscribers grew by 8.8 million to end 2008 at a total of 18.5 million. Telco TV during 2008 transitioned from the early-adopter stage to the early majority stage, so sales volume should now start to ramp up significantly for several years. North American telephone companies added a net 3.3 million television subscribers in 2008, the company says. Smart businesses are beginning to produce content that’s less about their product and more about topics that their customers gravitate to, writes Rick Burnes, an inbound marketing manager at HubSpot. Whole Foods publishes recipes and cooking videos. These companies are producing quality media, just like The New York Times or Discovery Channel. Why? Every company, no matter what industry, is essentially gathering and distributing information, both to employees and external audiences, and trying to attract attention from prospective customers. Traditionally, this has been an "outbound" function using intermediaries such as media, trade shows, email blasts and direct sales, where companies reach out to potential customers. These days, one sees use of webinars, blogs, Web site content, news feeds, videos and other efforts that invite potential customers to show up. So every company now produces and distributes content. DirecTV continues to offer the most high-definition channels of any pay TV provider, but Verizon is catching up quickly with its FiOS TV service, according to Pike & Fischer. The firm finds that as of January 2009, DirecTV was offering as many as 104 channels in high-definition format. But that only beats Verizon's HD menu by one channel. Comcast, the largest cable operator in the United States, has one of the smallest selections of high-definition channels, Pike & Fischer says. Comcast in some markets is offering less than 40 HDTV channels, although the company's marketing focuses on its large selection of HD movies, TV shows and other content available on demand. Most providers examined in the study charge a premium price for HDTV service, usually less than $10 per month. But some, including Cablevision and Time Warner Cable, offer a substantial number of HD channels for free. Some will look at Qwest Communications International Inc. fourth quarter and full-year results and see trouble; others will see improvement. Irrespective of those judgments, it should be noted that for Qwest, business markets and wholesale are the majority of the business. Mass markets, which includes both consumer and small business revenue, represented about $1.4 billion worth of fourth-quarter revenue (and some portion of that is small business). Wholesale markets contributed $789 million. Business markets represented $1.1 billion. In other words, Qwest one of these days relatively soon will be earning more money from wholesale and business customers than from consumers, as important as consumer markets may remain. Furthermore, revenue in business markets grew year over year, while mass market and wholesale revenue declined, with those declines attributable to voice services. In the fourth quarter of 2008, net income was $185 million, or 11 cents per diluted share, compared to $366 million, or 20 cents per diluted share, for the fourth quarter of 2007. Bad, eh? Not if one considers the adjustments. The results include severance charges of $19 million, or one cent per diluted share, in the fourth quarter of 2008. More important, though, the earnings per share calculations reflect higher pretax income compared to the fourth quarter of 2007, offset by increased tax expense as the company recorded normal effective tax rates beginning in 2008. Income before income taxes in the fourth quarter increased 17 percent compared to the fourth quarter of 2007. Adjusted EBITDA for the quarter was $1.18 billion, a four percent increase compared to $1.14 billion in the year-ago period and a nine percent increase compared to $1.08 billion in the third quarter. Adjusted EBITDA margin was 35.6 percent compared to 33.1 percent in the fourth quarter of 2007 and 32.1 percent in the third quarter. to $2.9 billion, or $1.52 per diluted share, in 2007. Full-year results reflect the same normal effective tax rate dynamics as the fourth quarter. Total revenue for the fourth quarter of $3.3 billion reflects an eight percent year-over-year growth in data, Internet and video revenues, which was offset by a decline of nine percent in voice revenue and a 33 percent decrease in wireless revenues. As Qwest tells the story, income before income taxes increased 17 percent year over year while EBITDA increased four percent. Enterprise data and IP revenue was up nine percent year-over-year. Data, Internet and video revenue now 25 percent of mass markets revenue, a key measure of how well Qwest is replacing declining landline voice revenues with new and alternative revenues. Qwest's consumer broadband subscriber base increased nine percent year over year. Historically, the transmission belt for new applications and communications technology has been that university researchers would come up with something new, suppliers would sell those innovation into the enterprise market, and then at some point the tools move into the mid-market, then finally into the smaller business entities, finally winding up as consumer tools in the final stage. These days, there are different avenues. In many cases, innovations come out of universities, then go straight to the consumer market and then fairly quickly into the small business market, with enterprises and mid-market customers becoming aware of the trends only as individual "lead users" start to make use of the tools in their work roles. Of late, in fact, it is hard to point to any significant innovations that went enterprise first, with the exception of mobile email, which was driven by enterprise users. Everything else pretty much developed first in a consumer context, including instant messaging, text messaging, any-to-any email, social networking, blogging and wikis. One might get an argument about wikis, but some of us would consider wikis to have been popularized in the consumer space. So it is with software as a service, which most observers will say has gotten most traction in the small business and consumer spaces, and only now is being considered in the enterprise and mid-market spaces. One has to assume the opportunities for such changes are enhanced by the challenges businesses and organizations now face, as potential buyers now are facing new questions about how they ought to be doing things. There is a sentiment in some quarters that the telecommunications industry is too inflexible, slow moving and unimaginative to transform itself. Those criticisms are well taken. They could be right. But look at matters a different way. If executives know what business they really are in, they won't make the proverbial mistake the railroad industry made: thinking it was in the "railroad" business instead of the "transportation" business. In fact, a quick review of technology underpinnings of the communication industry should tell the story. AT&T once meant "American Telephone & Telegraph." The telegraph, and the business it created was an 1840s invention. The telephone was a 1870s invention. AT&T made the transition. Wireless was invented in the 1890s. And though they were slow to enter the business, large "landline" providers now lead the wireless business. Computer communications began in the 1970s. Large telcos pretty much failed at their first efforts to enter the "computing" industry. But in different ways, they now are re-entering the computing services market, as integrators, content delivery networks and, someday, players in "cloud computing" infrastructure. Optical communications began in the 1980s and telcos and cable companies are major end users of optical communications. The Internet originated in the 1990s and now Internet access is almost a "legacy" product for telcos and cable companies. The next wave of IP-enabled next generation networks has barely begun. But I am hard pressed, looking at history, to worry too much about ability to finesse the latest waves of technology advance. There continues to be talk in the communications business about network infrastructure providers as "dumb pipes." That's a bit of an analogy to the "content is king" discussions that the video business periodically revisits. Put simply, there is a tension, in either communications or media businesses, between the value added by network services and applications, and the debate never seems definitively solved. Consider the case of Time Warner, which is in both the "content creation" and "network delivery" businesses. Some financial analysts say the content assets are overvalued, compared to the cable assets. Time Warner Cable trades at a discount to Comcast on price-to-earnings multiple, some note. To be sure, some analysts worry about increasingly effective competition from Verizon and AT&T. But Time Warner Cable still is adding net subscribers in a recessionary environment. Of course, these debates tend to run in cycles. Distribution was the focus of the entertainment industry for much of the past 15 years. The large entertainment conglomerates took advantage of looser ownership regulations and technological advances to acquire more television and radio stations, cable and satellite subscribers, and internet portals. Basically, that's an argument for the importance of distribution. Some think there will be a swing in the other direction, as content owners increasingly focus on distribution across all platforms. News Corp. and Time Warner now are now sellers of distribution assets, for example. That doesn't necessarily speak directly to the relative importance of distribution compared to content ownership, though. It might be closer to the truth to say that in a climate where capital is scarce, and viewership is changing rapidly, content companies need to stick to their knitting. Conversely, some of us make the argument that distribution remains vital, and in any case is a far-bigger business than content. In 2003, for example, Hollywood box office revenues were $11 billion in the United States and $25 billion to $30 billion globally. The global music industry earned $35 billion. Videogaming, consoles and all software represented $40 billion worth of revenue. In contrast, U.S.telecom revenues pulled in $348 billion. Content is sticky, content is a fairly large business, content is part of the business the telecom industry now is part of. But that's not the same thing as arguing "pipes" are commodity items with no ability to differentiate. In fact, those pipes remain highly-valuable, very-scarce assets supporting a huge applications business. Voice is declining in value, to be sure. 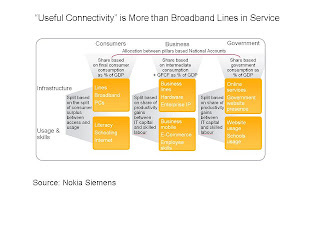 But broadband and mobility apps have arisen to replace those lost revenues. And the new frontier is all sorts of other business models, ecosystem relationships and values. That isn't to say the transformation will be easy, or steady in its progress. So make no mistake: transparent optical transport and access are, in some ways, undifferentiated at the moment. But that does not mean the values, features and applications delivered over those pipes are undifferentiated or commodities. It may never be possible to determine, once and for all, whether "content" or "distribution" are "the" king of the ecosystem. One thing is clear, though. Distribution is a far bigger business, because it includes the large person-to-person, machine-to-machine and one-to-many and many-to-one communications functions. Will Recession Lead to Permanent Behavior Changes? Nobody yet knows when the current recession will end, or what will happen to various industry segments during the recession. What is even less known is how consumer and business behavior during the recession might carry on in the form of new trends once the recession is but a memory. Recessions can cause people to think more about the effective use of their assets. In bad times, users are forced to see if there are substitute ways of doing things that save money right now. But if the substitutes are good enough, people might not go back to their former preferred ways of doing things. At a practical level, business buyers in many cases are taking longer to make decisions, so the time lag from proposal to acceptance is stretching out. But there still is little, if any, concrete evidence that business or consumer users are abandoning key services ranging from broadband access to wireless to multi-channel video. In fact, the evidence so far indicates they are behaving as they have in the past: keeping services but delaying upgrades and adoption of new enhanced services. What bears watching are signs some customers are behaving in new ways, such as canceling multi-channel video subscriptions in favor of Internet alternatives. A recent poll by researchers at the Yankee Group suggest that one percent of respondents actually have done so. Then there is the impact of users dropping landline services in favor of mobility, or using Skype instead of their landlines or mobiles, switching to prepaid from postpaid mobile plans, buying hosted business voice in place of new phone switches or buying some forms of broadband access instead of others. The point is that tougher economic conditions will lead some consumers to experiment with new behaviors that might become permanent changes. The revised Senate version of the "stimulus" bill has not yet been passed. Nor has it been reconciled with the House version. But there could be big differences. The revised Senate version funnels money through the National Telecommunications & Information Administration. The House version splits disbursements between NTIA and the Agriculture Department. The difference? For a company such as Qwest Communications, the Agriculture Department funds would not be available, because of Agriculture Dept. rural loan program rules. The NTIA program does not operate under those rules, making Qwest eligible to apply. Essentially, Agriculture Dept. rules ascertain eligibility on a statewide basis, while NTIA would fund on a community basis. As Qwest serves both urban and rural communities in each of its states, it has been ineligible for rural broadband loans that it might otherwise qualify for. So the reconciliation process will be crucial. The 778-page Senate version of the "stimulus" bill apparently calls for about $6.5 billion in tax credits for supplying broadband to rural or "under-served" areas. It is not yet clear what will happen when the Senate version of the bill is reconciled with the House version. The House version includes more specific references to broadband speeds, while the Senate version deletes those references. Earlier versions of the Senate bill had talked about providing tax credits for building new capacity in rural and underserved areas would be as much as 40 percent, but only for service operating at 100 Mbps or faster. A 30-percent credit would be offered for service operating at 5 Mbps or better. The bill also seems to allow 40-percent credits for wireless service operating at 6 Mbps or better downstream and 30 percent tax credits for wireless service of 3 megabits per second or better. It does not appear that those clauses remain relevant in the new revised Senate "stimulus" bill, and reconciliation with the House bill might reinsert them in some way. The revised language could be quite important, though, as many investors might balk at the notion of building 100 Mbps service as a prerequisite for getting loans under the broadband program, which in the revised Senate version also would operate under National Telecommunications And Information Administration oversight, not shared with the Agriculture Department as in the House version. What a chore it has been to read the revised bill, and the original bill before it! Sprint Nextel Operations Outsourcing Imminent? Sprint Nextel Corp. soon will announce it is outsourcing part of its network operations to Ericsson, removing about 2,000 to 7,000 employees from Sprint's payroll, reports the Kansas City Business Journal. That move, which would indicate Sprint Nextel no longer considers some parts of its network operations to be so important they must be staffed in-house, could affect about a third of Sprint’s network employees. Sprint spokeswoman Lisa Zimmerman-Mott denied the report, though. Sprint has said it would cut 8,000 jobs by the end of March. Those cuts include the head of Sprint’s network, Kathy Walker. In addition, former Ericsson executive Sven-Christer Nilsson joined Sprint’s board in November, the Kansas City Business Journal reports. Cusick estimated that outsourcing network operations would save about 25 percent of expenses in that area. The Congressional Budget Office now estimates that by 2019 the Senate "stimulus" legislation would reduce U.S. gross domestic product by 0.1 percent to 0.3 percent. H.R. 1, as passed by the House, would have similar long-run effects, the CBO says. "Most of the budgetary effects of the Senate legislation occur over the next few years," CBO says. Even if the fiscal stimulus persisted, however, the short-run effects on output that operate by increasing demand for goods and services would eventually fade away." "In contrast to its positive near-term macroeconomic effects, the Senate legislation would reduce output slightly in the long run, CBO estimates, as would other similar proposals." "In principle, the legislation’s long-run impact on output also would depend on whether it permanently changed incentives to work or save. However, according to CBO’s estimates, the legislation would not have any significant permanent effects on those incentives." $6 to $9 Billion for Rural Broadband Soon? Maybe Not. Don't get your hopes up that the $6 billion to $9 billion in potential "economic stimulus" spending to support broadband in rural areas will have any near-term measurable impact, either as a way of getting the country out of its current recession, or getting more broadband to rural users. Analysis from the Congressional Budget Office now indicates it will take seven years to get that money spent, and, at best, about 60 percent of the money might be spent in the years leading to 2011. In other words, by the time most of the money actually gets spent, the recession is likely to be over. The CBO projected that much of the $6 billion in broadband grants geared to underserved and unserved areas will be spent between 2012 and 2016. Praiseworthy though the effort to extend rural broadband is, the current proposal does not seem to support the goal of "stimulus," which is to put money to work right now. For starters, any grantees would have to put up 20 percent of any project's cost from their own, or other sources. One might question the ability to do so, under current tight credit conditions. Then there are "open access" rules that might affect 100 percent of any grantee's business. And there is no definition of what that means. Right now, any executive would have to factor in the impact of those rules on the whole business as the price of getting grant aid. Depending on how "open access" is defined, service providers might well conclude they cannot accept funding. "CBO anticipates that funds provided to the National Telecommunications and Information Administration to administer the broadband grant program would take longer to spend--seven years--because the new appropriations would far exceed the agency's 2009 funding of $17 million, and the legislation would require, in most circumstances, that grant recipients provide 20 percent of the project's cost from non-federal sources," the CBO says. So an agency geared to disburse $17 million annually would have to suddenly gear up to disburse nearly $3 billion, an increase of two orders of magnitude. If you've ever had any hand in running any agency that does this sort of thing, you know that increases of that scale simply cannot be handled effectively, that fast. Under the House-passed bill, about $6 billion for broadband grants and loans, the National Telecommunications and Information Administration would distribute $2.8 billion in broadband grants with $1 billion going to wireless broadband. The Rural Utilities Service is expected to administer the remainder through its broadband loan program. The Senate is working on a $9-billion version that would include tax credits. New Era of Discrete Apps? Many changes are possible as we move into an era of Web-based applications, built and accessed as Web services. On the demand side, users will be accustomed to a new way of buying and using software. On the supply side, we will see different business models. Especially for communications-enabled business processes, we likely will see more reliance on something we might call "discrete applications," rather than the more-monolithic approach we have seen historically, where lots of features were purchased upfront with the buying of a switch solution, for example. That doesn't mean every application is efficiently provided discretely. Generally speaking, large scale tends to dramatically tip the scale towards platform-based solutions. Conversely, low volume tends to tip the scale towards hosted, Web-based approaches. That is a pattern we have seen for services such as business phone systems, carrier switches and server farms, for example. If a provider or enterprise has high volume and lots of users, buying and owning switches and facilities tends to make more business sense than leasing or renting services or capacity. Conversely, small entities with relatively low volume demand almost always are better off renting capabilities rather than buying and owning their own infrastructure. Roughly the same sort of economic logic should come into play in a new era where more applications are built and intended for use by relatively smaller number of users than in the past. The example already is seen in the broad consumer market. Consider even broadly-purchased applications and services such as multi-channel video services. In an older paradigm, a single provider might expect 70 percent penetration. In a competitive market, even a successful provider might expect to get just 30 percent penetration. That changes the economics of network investment. Where once a provider might build a whole network and expect to get customers at seven out of 10 homes, now a provider has to build a network where ultimate penetration is three homes out of 10. that means shared costs must be borne by a considerly smaller number of actual paying customers. In the Web sphere, roughly similar sorts of phenomena are at work: in the vast majority of cases, any single application will have a smallish number of users. The opportunity for any single application will be quite small, compared to an earlier era where most people used a small number of relatively-standard applications. The good news is that all of the tools and infrastructure we now have will support robust business models even at relatively lower levels of end user demand. So one of the other implications is that we may be entering an era of vastly-expanded use of "discrete applications," custom built in many cases using pre-built modules or "primitives." That in turn presupposes new ways of packaging, pricing, marketing, delivery and support, new ways of discovering needs and building solutions to match those needs. This means more discrete apps and fewer of the monolithic sort, even though some apps will continue to be relatively monolithic because they have mass usage. What broadband really needs--more than money to build more broadband-- is action on the demand side, says David McClure, U.S. Internet Industry Association president. The reason is that only about one percent of Americans actually cannot buy broadband access if they want to. "We can now reach 99 percent of all households in the United States with some form of broadband," he says. "We are in pretty darn good shape." The issue some policy advocates seem to be concerned about actually is not "availability" but rather "appetite" or other issues. Some potential customers might want broadband, but do not own PCs. Others might want broadband, but can't afford to buy it. Many potential users do not use PCs. About 25 percent of the U.S. population does not use the Internet at all, McClure notes. "Worse than that, they don't care if they don't get it." About 51 percent of the non-users say the Internet is not relevant to their lives, McClure adds. It is true that 66 percent of the U.S. population now has some form of broadband at home. But that is a different matter than "availability." Cable modem service alone reaches 19 out of 20 homes in America, for example. About nine percent of users have a dial-up connection. 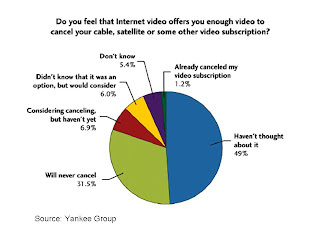 Of these, the majority cite price as the reason they haven't switched to broadband. "Broadband in America is in wonderful shape and if you hear differently, it is a lie," McClure says. "Adoption is the problem, not deployment." That doesn't mean we should neglect targeted investment in some areas where broadband really is not available or where coverage is spotty, he says. But there are several demand side issues that must be tackled to stimulate more usage. literacy is an issue. PC ownership and training are issues. Investments in “smart networks” to enhance the efficiency of the networks and provide for advanced products and services also would be useful. "Ask a 'public policy' advocate to name a place where broadband isn't available," McClure says. "They don't know any." "U.S. broadband infrastructure is ranked fourth in the world and rapidly improving," he says. "U.S. broadband adoption is ranked at 15th in the world and not improving." The important point is that "we are 15th in terms of adoption, not availability." A recent survey of over 1000 households conducted by ABI Research found that 36 percent of those who currently use social media on a regular basis say they’d like to access their networks on the TV screen. Younger consumers were more interested in engaging with their friends through chat and messaging, while middle-aged respondents were more likely to be interested in more passive social networking behavior such as checking status updates. The most popular potential application for those over 50 who expressed interest in TV social networking was being able to see what their friends were watching on TV. Both broadband access and voice seem to be down across much of the state. How does Time Warner Cable perform in a full year of recession? By growing revenues eight percent, or $1.2 billion, over full-year 2007, to reach $17.2 billion. Subscription revenues were up eight percent($1.2 billion) to $16.3 billion. Video revenues grew four percent ($359 million) to $10.5 billion, benefiting from the continued growth in digital video subscriptions and video price increases. High-speed data revenues rose 12 percent ($429 million) to $4.2 billion, driven by continued high-speed data subscriber growth. Voice revenues climbed 36 percent ($426 million) to $1.6 billion. The rate of revenue units added slowed later in the year, though. That is in line with past recessions, when customers delayed adding more enhanced services. Still, Time Warner faces a problem in its legacy video business that telcos face in their legacy voice business. Time Warner Cable is losing "basic video" subs, as telcos are losing voice line customers. Time Warner Cable lost 119,000 customers in that category when some analysts anticipated 27,000 to 46,000 or so basic cable customer losses. Keep in mind, though, that these losses would likely have occurred even without a recession, as market share shifts away from cable and to telco video services are a secular trend that was underway before the recession. About 60 percent of working Americans (18 years old or more) used one or more social networking sites at end of 2008, according to Compass Intelligence. About 35 percent of working Americans say they use Facebook, while 29 percent say they use LinkedIn. About 60 percent of working Americans not using social networking say they don't use them because "it's not a good use" of their time. I've been speaking on, and running, panel sessions on unified communications for some time, as have many of my other associates who follow UC. I've noticed a shift early this year: people now are talking a lot more about conferencing, and less about integrating voice, instant messaging,email, mobile and fixed services. What that suggests is that "what is selling" is conferencing. It might, or might not, suggest a certain sluggishness of buyer response to the more-traditional pitches. Jill Taylor, product marketing executive for Verizon Business, says "conferencing is becoming the lead product for UC." That's a switch. Verizon Business is one of the first global service providers to integrate audio and Web conferencing services across multiple leading IM services, including IBM Lotus Sametime Unified Communications and Collaboration, Microsoft Office Live Communications Server 2005 and the Cisco Jabber XCP, says Taylor. "I don't know that it is the economic climate solely, but it plays there," she says. The idea is to use a presence-based client to escalate into an audio or a net session, making the meeting experience more intuitive, instantaneous and flexible, Taylor says. Sametime, Lotus, Jabber are supported. Also some additional integration: leader can launch other features such as Web moderator, a call management tool that allows you to visually see who is on a call, record a session as well. Better integration from the desktop. Lots more intuitive. The push for Jabber conferencing came from the finance and pharmaceutical communities, which are key Jabber user verticals. The new tools are available immediately for U.S.-based organizations and are scheduled to be rolled out internationally later this year, along with Verizon audio and net conferencing integration with Microsoft Office Communicator 2007. Also, Verizon Business is calling the new features "spontaneous collaboration." The linguistic shift is important. "UC" is a reasonable provider-side description. But it doesn't necessarily resonate with end users. "Spontaneous collaboration" is better. From an end user perspective, it better describes "something I can do." More 3G, But Majority of Users Don't Use Broadband Features? Use of smart phones with full HTML browsers that offer a true Internet browsing experience increased steadily in 2008, according to comScore. the year. But users on 3G networks grew 43 percent from November 2007 to November 2008. 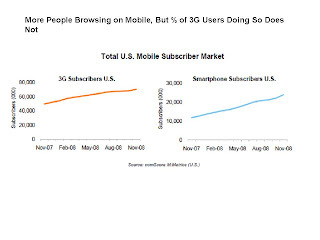 So the percentage of 3G users using the mobile Web did not change over 2008. In fact, the percentage of 3G users who do not use the mobile Web might have slipped a bit.